Danica Patrick will make history on Sunday when she starts the Daytona 500 in Florida from pole position. The 30-year-old is the first woman to take pole in a Nascar Sprint Cup race - the elite level of stock car racing in the United States. "I'm going to do everything I can to keep the car as up front as possible," said Patrick ahead of Sunday's race. Patrick was the first female to win an IndyCar Series race in 2008 and now aims to repeat the feat in Nascar. "I don't think about being a woman when I'm out there on the track," Patrick added. "I'm really just focused on driving and working with the team. "I've been lucky enough to make history, be the first woman to do many things. I really just hope that I don't stop doing that. We have a lot more history to make." Patrick took pole for the Stewart-Haas Racing Chevrolet team at the Daytona Speedway with a qualifying time of 45.817 seconds and a top qualifying speed of 196.434mph - the fastest qualifying effort at Daytona since 1990. Janet Guthrie had previously held the record for the top grid position by a female in the Sprint Cup, twice starting ninth in 1977. Patrick's historic Daytona pole is another landmark for the American who has continually broken down barriers in the male-dominated world of motorsport. The 5ft 1in driver began her senior racing career in Britain, leaving Illinois to drive in Formula Ford alongside former British Formula 1 driver Anthony Davidson. But Patrick made a real impact when she returned to the US and moved to IndyCar - the open-wheel, single-seater series similar to F1 - in 2005. She came close to becoming the first woman to win the prestigious Indianapolis 500, leading the race before finishing fourth behind the late British driver Dan Wheldon. The Daytona 500 is famous for throwing up unlikely victors and just nine of the 54 men to win the race have started it in pole position. It was the start of so-called 'Danica-mania' that saw Patrick appear in Super Bowl advertisements and glossy magazine photo shoots, making her a household name and one of the richest female sports stars in the world. Three years later, Patrick raced to another landmark when she became the first woman to win an IndyCar Series race in Motegi, Japan. However, Patrick struggled to consistently challenge for race wins and, with a seven-year itch setting in, she made a permanent switch to Nascar in 2012. In her first full-time season in the Nationwide Series season, Patrick finished in 10th place with four top-10 finishes. The Sprint Cup represents another step up for Patrick in 2013 - and another opportunity to break barriers as a female racer. 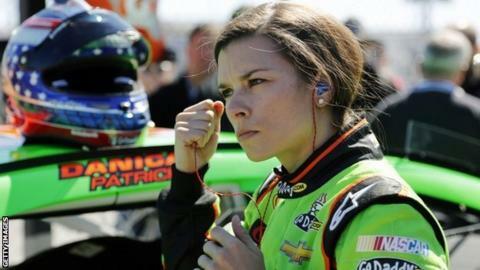 The series is the most-watched form of motor racing in the US and her performances here will be under further scrutiny. But Patrick has already gone some way to answering her critics by taking pole in the opening race of the 2013 season in Daytona. She could make a real statement if she wins the 500-mile, 200-lap race in Daytona. Guthrie holds the record for the best finish at the highest level of Nascar racing, finishing sixth in 1977. Patrick will face tough competition on Sunday from Jeff Gordon, who lines up alongside her on the front row, as well as second-row starters Kevin Harvick - tipped as the pre-race favourite - and Kyle Busch. Her new boyfriend Ricky Stenhouse Jr is also in the 43-car field, starting down in 28th. Where are all the women drivers? Read more on Where are all the female Formula 1 racing drivers?